Earth has become a truly troubled place, ruled over by hypercorporations and CEOs rather than politicians and royalty. Not all of the old world powers have gone quietly into the night however, and one in particular holds onto his grasp. A team of operators (Lucky Mack, Corruption, LANrefn1, and Override) have taken on a job that may well threaten this monarch's throne—provided that they survive long enough to finish it. From start to finish every step of the operation is fraught with danger, and each of their talents will be tested before a game played across the centuries finally reaches its end! 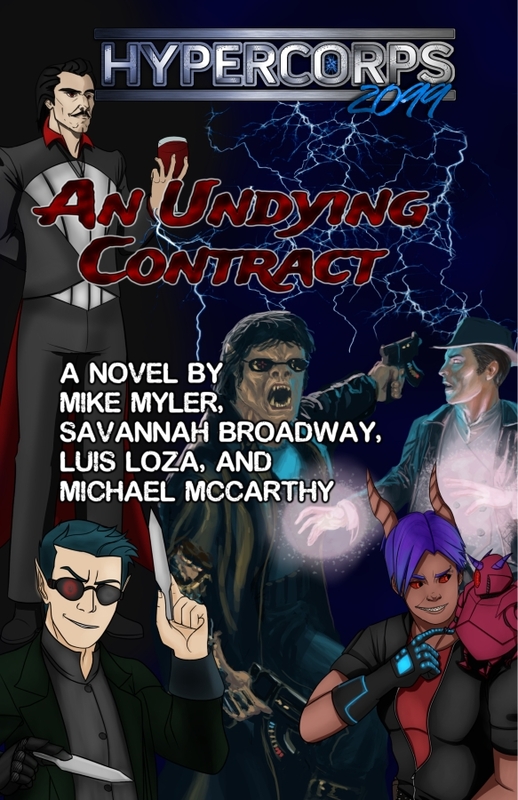 An Undying Contract is a 165-page novel by Mike Myler, Savannah Broadway, Luis Loza, and Michael McCarthy set in the exciting cyber-supers dystopia of Hypercorps 2099! Digital downloads include both PDF and EPUB formats.